DARIEN — A variety of plastic-bag-themed artwork hung from the Town Hall walls Monday, as part of Bring Your Own Darien’s art show tour. 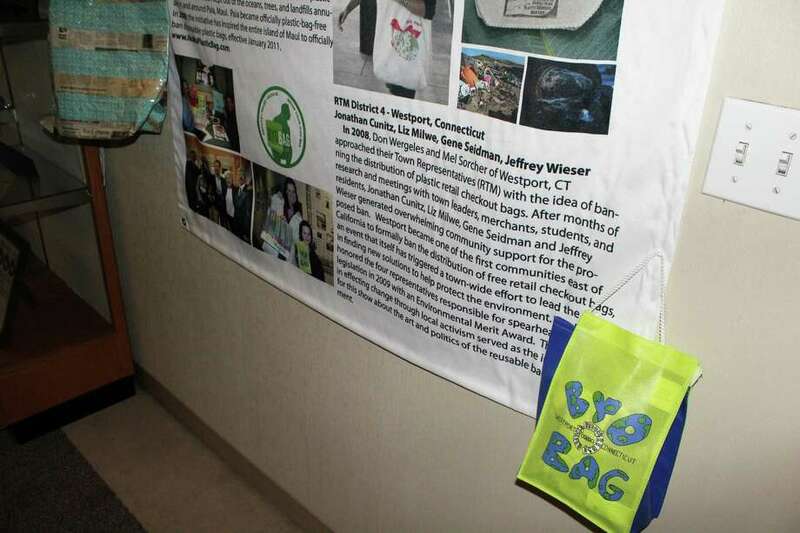 “The first aspect is to show different styles of reusable bags and the people who are using them,” she said. The second is a collection of photos showing sea life and how they interact with single-use plastic bags, while the third presents work by conteporary artists who have created items with single-use plastic bags. Milwe, a Westport resident, learned of the negative effects of plastic bag use while on a trip in San Francisco. “I started to research plastic bags, and I found around the world they had banned plastic bags in some of their communities,” Milwe said. On display upon entering Town Hall are different forms of reusable bags, including those made from rice bags by women in Cambodia, as well as artwork. By working with the nongovernmental organization Gecko Traders, the women are able to earn livable wages while working towards a sustainable local economy, Milwe said. “As I started to become interested in plastic bags, I began to study them around the world,” Milwe said. Bags made in the Philippines are also in display along the wall in Town Hall. The intricately crafted bags are created from recycled phonebooks cut into strips, woven and shaped around boxes. “You can even see some of the newspaper print as you get closer to the bag,” Milwe said. In Indonesia, bags crafted from detergent boxes hang on the wall, Milwe said, and Indonesian women also craft bags from juiceboxes. “It’s just amazing how you can find something in your community that’s just being thrown out and make something useful out of it,” she said. Westport artist Miggs Burroughs also contributed his art titled “Jelly Bags” to the show. The picture displays jellyfish swimming in the sea from one angle, but a different angle shows plastic bags floating underwater. Along another wall hung a reusable bag from Westport, which passed its own plastic-bag ban in 2008. Milwe said through using reusable bags, residents can help improve the enviroment. “We all have to change our habits to make for a better enviroment for our children,” she said. The exhibit will be on display at Town Hall until Nov. 15.